The brilliant artist, the founder of Impressionism, Auguste Renoir, is known as an unsurpassed master of painting. Especially well he managed still life. Auguste took everyday life and charming women as a basis for his plots. Only occasionally did the master decide to write flowers. All his works are filled with air, saturated with lightness and sunshine. The color scheme is quite soft. Pictures consist of shades of pink, blue, lilac, muted green. Remembering the artist’s work, it is impossible not to mention one of his famous masterpieces – “Still Life with a Large Flower Vase”. The work was completed in 1866 and quickly gained popularity. The plot of the canvas is simple and straightforward, but made subtle and elegant. 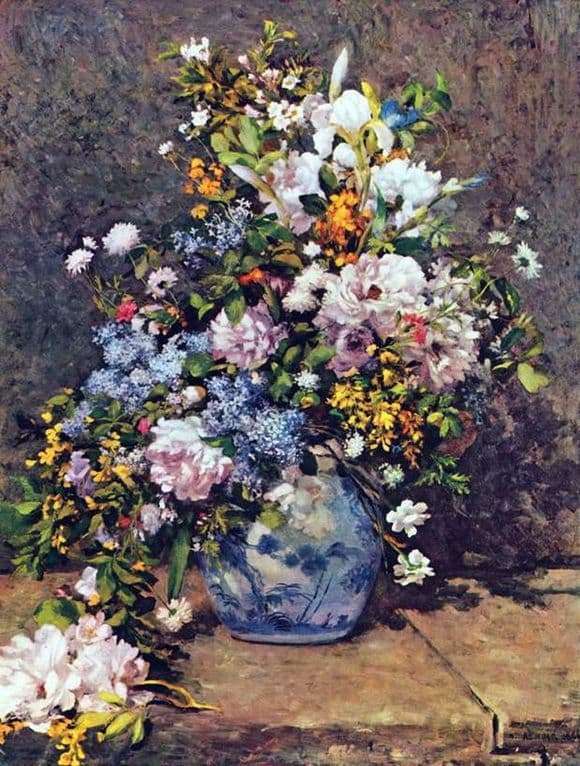 A large blue-blue vase is buried in the inflorescences of wild flowers, wild roses, and fragrant herbs. The proportions of the bouquet are so verified, and the details are so carefully written that the imagination cannot stand still. It seems that another minute, and a thin pink petal will fall on the brown rough surface of the table. The reason will be a gust of light wind, bringing the unusual delicate scent of plants. There is an opinion that Renoir created similar works for the purpose of receiving the income. The artist did not have to rely on big money. However, such plots bought up with pleasure and, to our time, almost completely dispersed to private collections.